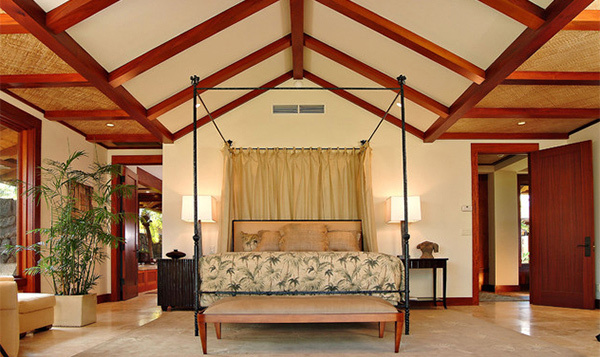 Most of the time, roof beams are concealed so you will see a plain ceiling or a decorative ceiling. 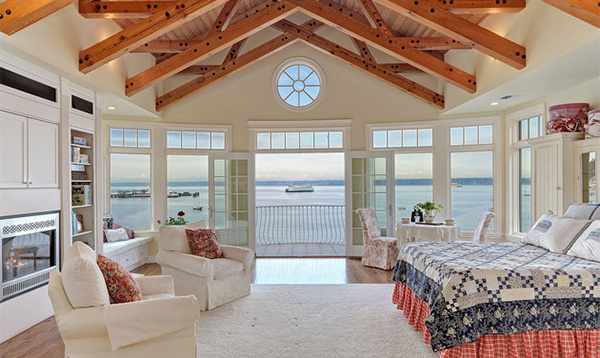 But there are some interior design styles that intentionally leave the roof beam exposed. 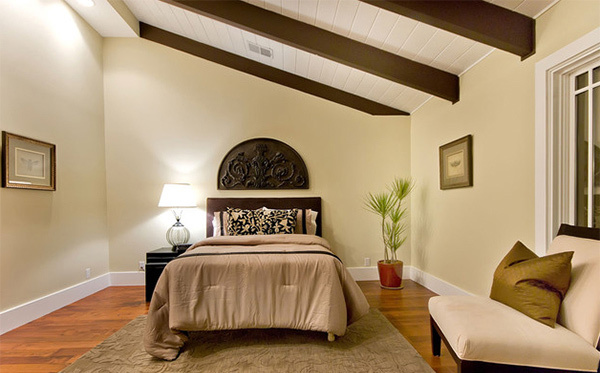 Some would even add some wooden beams to finished ceilings. You might wonder how this looks like. Well, we will end your curiosity because today we will show you bedrooms that has exposed beams. A contemporary bedroom looked a lot nicer with the exposed beams that matched the flooring. A gorgeous Mediterranean themed bedroom appears more dashing with the chandelier attached on the ceiling of exposed beams. 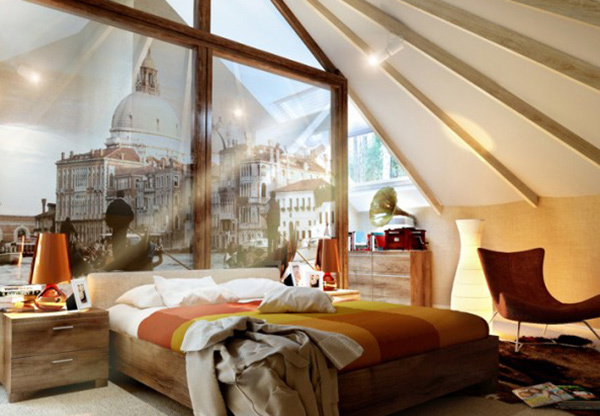 We’d say wow to this bedroom! Aside from the large glass window, the ceiling which is designed uniquely was not a hindrance to make this bedroom look cozy. The details of the rug and the wooden headboard matches well. And yes, the color of the beams were coordinated to the rest of the bedroom. 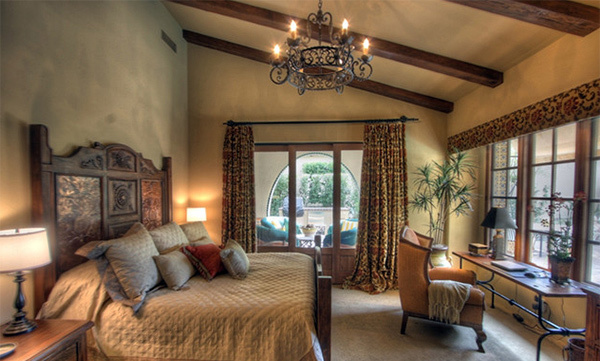 A bedroom with Tuscan touches and is indeed very beautiful! The details in the carved furniture and even the prints of the curtains completes the look of this bedroom. The white brick wall of this bedroom is an amazing touch to the interior. Add that up with the exposed beams and wooden panels on the other side of the wall. 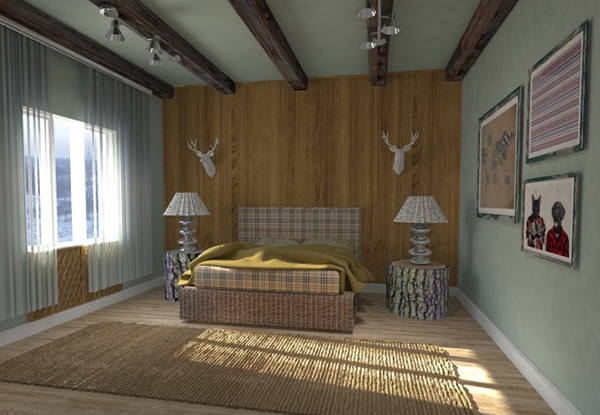 Wooden elements in this bedroom creates a warm and relaxing ambiance. The design in this interior is impressive combining chic touches with the elements of nature. Ancient olive for the walls made this bedroom look lighter despite the use of browns and patterns in other areas. 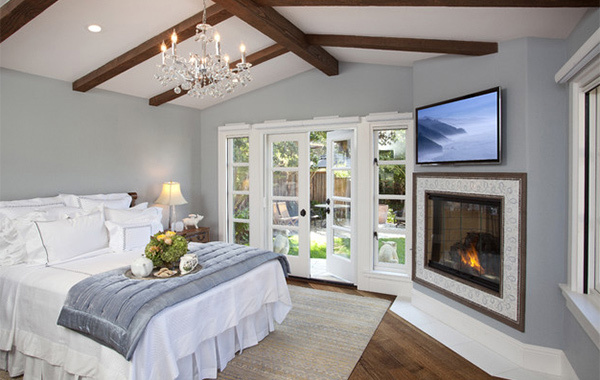 A traditional bedroom in gray walls and some modern touches for the fireplace. The chandelier draws your eyes towards the ceiling with exposed roof beams. A subtle version of a bedroom with exposed beams by painting it all in white. Another Mediterranean bedroom with wrought iron chandelier attached to the beams. Even with exposed beams, this bedroom looks totally neat because of the use of white paint. We’d say this bedroom with an adjacent sitting room has shabby chic touches. The furniture it used has some of this touches. Isn’t this bedroom beautiful? The exposed beams with black bolts in it added beauty to this white airy bedroom. 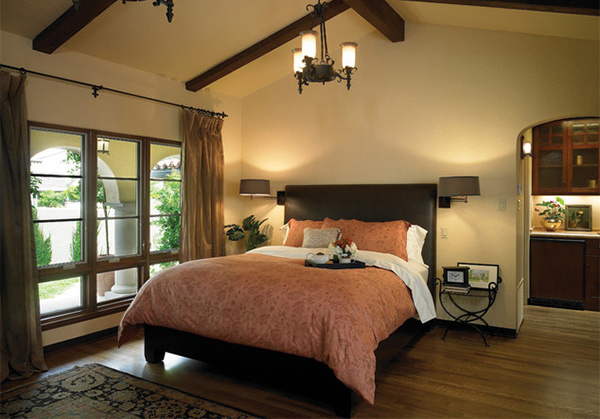 The four poster bed looked small in this bedroom with high ceilings and exposed beams in maple. 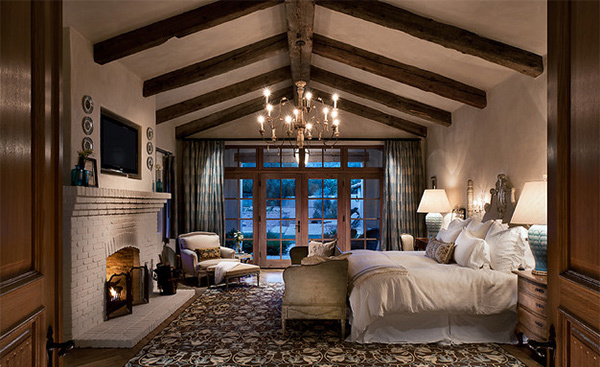 Exposed beams in bedrooms can certainly give it a different touch. You have also observed the variety of manners on how the designers worked on the beams and the rest of the bedroom’s decoration as well. Did you like it? Well if not, you can always conceal the beams and add some details to the ceiling. You can also get a unique bedroom design by having wooden panels or brick walls as accents.